HM the Queen's Birthday celebrates the birthday of Sirikit, born as Sirikit Kitiyakara. She was born in 1932 at the home of Lord Vongsanuprabhand. She went to Britain at the age of 13 together with her father, who then was the ambassador to the Court of St. James's. 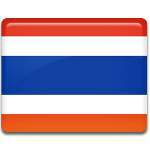 In Britain Sirikit learned English and French. Soon she moved to France, where she med King Bhumibol Adulyadej. They married on April 28, 1950. Celebration of HM the Queen's Birthday features various activities. The streets are decorated with blue flags, symbolizing the royal house, and Queen's portraits. During the 1980s another tradition was started in Thailand. Prime Minister campaigned celebration of Mother's Day on birthday of Sirikit. Establishment of the second holiday brought another tradition: women get souvenirs, decorated with jasmine flowers, considered to be the flower of the queen.